Some days are good: you feel powerful, happy — like there's nothing on this planet that you can't do. Other days, you're bloated, you're mad, and you get stuck in a sewer grate. Police officers in Zion, Illinois responded to a call about a plump raccoon stuck in a sewer grate on Thursday, and sure enough, upon arriving at the scene there was a plump raccoon stuck in a sewer grate. Here is what the raccoon looked like in the moment. As a police officer no 2-days are the same. Ofc. K. Vaughn responded to a call for assistance this morning for one of our furry residents. It seems this little guy has been eating a little too well and got caught in the sewer grate. Animal Control Ofc. R. Knorr & Ofc. Vaughn were unable to remove him and had to request help from the real heroes over at the Zion Public Works Department. They were able to free him and our friend was no worse for wear. Check out the photos and see if Ofc. Vaughn is more scared of the raccoon than it is of him! All in good fun, nice save Ofc. Vaughn. 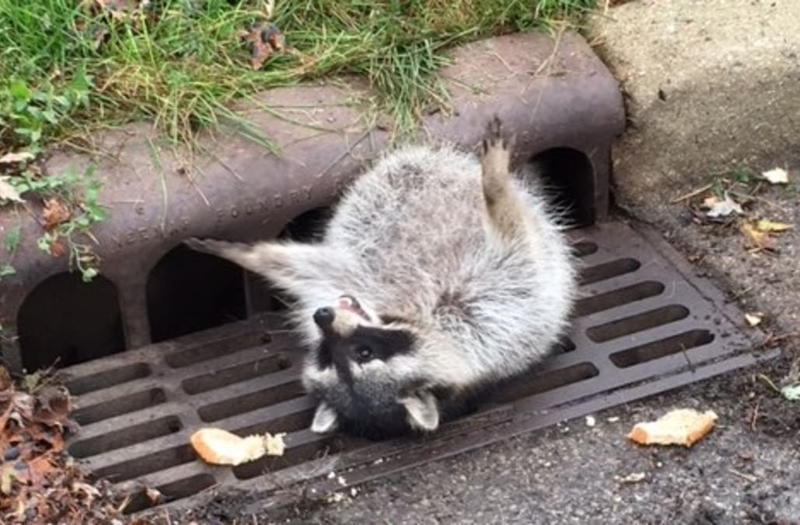 We all know the feeling of being too bloated to remove yourself from the sewer, and we can all surely sympathize with what this raccoon was going through. Luckily, officials were there to save the day. According to a Facebook post by the Zion PD, the raccoon was simply too... big boned... to be removed by the officer, so experts had to be called in from the public works department. Eventually, the raccoon was in fact freed.